One of the most obvious things I like to do is eat. I also love cooking and its one of the activities Kris and I enjoy doing together. We will have a great dinner out and the next day go out and look for the recipe and ingredients and try and make it our own. Jude loves to sit and watch over us. I hope he will pick up the cooking gene when he is older. An eggplant, of course, we bought a smaller one because we are cooking for 2 and a half (Jude). Spaghetti sauce, Italian seasoned bread crumbs, basil (you do not have to buy the whole plant), eggs, olive oil, tomatoes, mozzarella cheese, and ricotta cheese. The market we went to was out of small packages of fresh basil so we opted for the plant/tree. We use basil often and it was on sale for $3.50. Wash and cut the eggplant as thin or as thick and you desire. We are going to use two slices in one serving so I like them no thicker than an inch. Beat two or three eggs (depending on your serving size), and place the bread crumbs in a bowl or a ziplock bag. I use the shake and bake method, so the bag it is! Place the slice of eggplant in the eggs then in the bag with the crumbs, make sure to cover the entire slice. Fry in a shallow pan with a small amount of extra virgin olive oil. Flip, and remove from pan when both sides are golden brown. Kris was the one with the idea to spread the ricotta on one half, and then placing another slice on top to make a second layer. For added flavor we riped up pieces of basil and evenly spread them all over the ricotta. Then we covered the top with the spaghetti sauce, a slice of mozzarella and it was ready for the toaster oven. For both looks and flavor, I garnished with a basil leaf and heavy handed dusting of Parmesan cheese. I have been raving about this place for a while now and I have yet to complain about anything there. 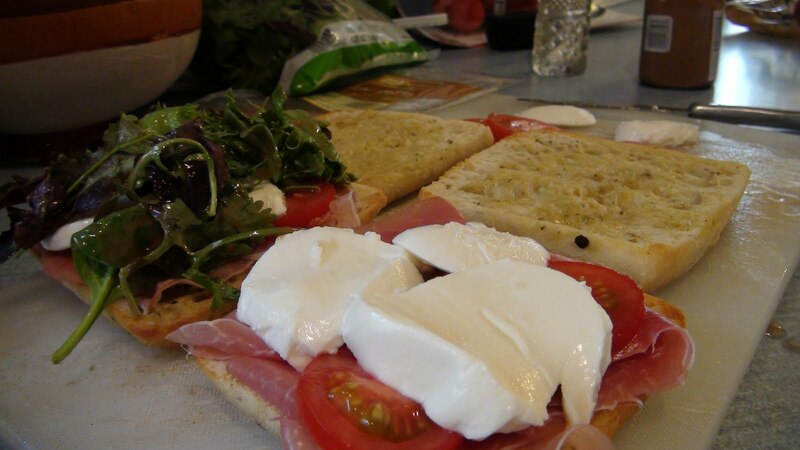 Every time Kris and I are in that direction we have to stop in and order our favorite sandwich, Caprese di Parma. Of course we had to put ourselves to the test and make it. bad boys so here we go. 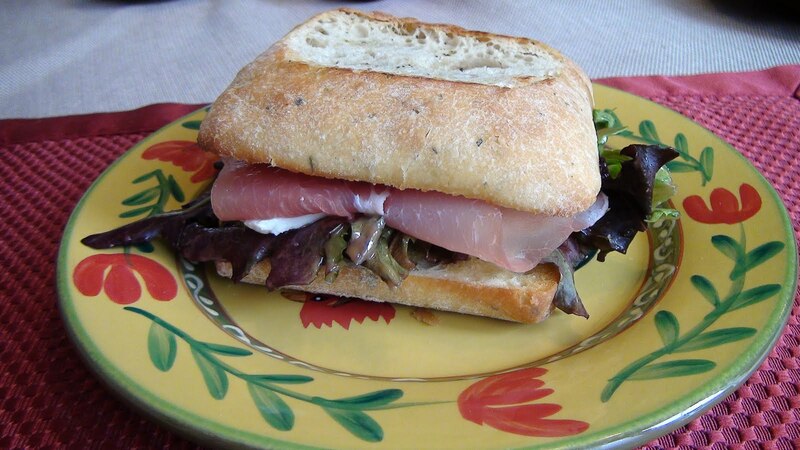 Ciabattini’s from Fresh & Easy markets is by far the best bread for this sandwich. its packed with flavor and with our luck it was on sale! We drizzled these tasty carbs with some extra virgin olive oil and popped them in the toaster oven for a few minutes until they were slightly crunchy. Slice up some vine ripe tomatoes, and in water mozzarella. This dish is one we have made several times. Its easy to make and takes almost 5 minutes to prepare. Let me know what you think of these kinds of posts. Do you like them? What do you want to see more of? Thanks for the feedback and the time you spent checking out one of my new passions!